This page lists all of the quest bosses found in Diablo and Hellfire. These are SuperUniques that must be killed to complete quests, with a few others who are related to the quest but are not essential to eliminate. Not all quests have a quest boss; while all quests require you to kill various monsters to complete them, there are often just a mob of regular monsters in the way, rather than a particular SuperUnique who must be dealt with. Quest bosses found in Diablo and (unchanged) in Hellfire. The Butcher is a cleaver-wielding murderous demon, and one of the scariest found in all of Diablo. He occurs in every multiplayer game and half of single player games, and is located within the butcher's block on level 2. The reanimated corpse of King Leoric must be defeated to complete his quest and free his followers from his malign influence. He is huge and dangerous, capable of raising skeletons to aid him in the battle. This quest is present in every multiplayer game, with the Skeleton King found somewhere on level 3. In singleplayer this quest occurs half the time, and when it does the Skeleton King is found on a sub-level, reached from level 3. This talking, comic relief Goatman is found on level three, but only in single player games. Gharbad isn't very difficult to defeat, but his quest is one of the most memorable in Diablo thanks to his amusing dialogue and pugnacious nature. Snotspill is a Dark One spear-wielder encountered within a special area of level four, but only in single player games. Snotspill orders the player to retrieve the "magic banner" that is guarded by the "big uglies," and says you must return it to him before he will remove a barrier blocking access to the stairs down to level 5. The "magic banner" turns out to be Ogden's stolen inn sign, which the player can return to Ogden for a reward, or give to Snotspill instead. Regardless of whether or not you give Snotspill the banner, he will treacherously attack you after a second conversation, when a wall drops to reveal dozens more Fallen Ones waiting in ambush. This singleplayer-only quest takes place on level 8 in the Catacombs, when a player finds Zhar the Mad in one of the library rooms. Zhar must be destroyed to complete the quest. Zhar always drops a spellbook when killed. Zhar the Mad NPC information. The Warlord of Blood is a Steel Lord boss found on level 13, in single player only. He is the most valuable quest boss in the game, not for his item, but for the armory of (random magical) 4 weapons and 2 plate armors he guards. Lachdanan is an NPC/monster found on level 14. Lachdanan is a Steel Lord, but he doesn't fight, and instead asks the player to find a golden elixir that will free his soul from the damnation brought down on him by the Mad King Leoric. Lachdanan's stats (which are purely for curiosity, since he can not be fought). Archbishop Lazarus is the betraying priest who did much to bring about the fall of King Leoric and the destruction of Tristram. Lazarus is found on level 15 in multiplayer, or in a special sub level reached from level 15 in single player. He must be killed to complete the Lazarus quest and to advance down to level 16 and Diablo. Warlord of Blood NPC information. Red Vex is found beside Lazarus in SP and MP games. She doesn't have to be killed to complete the quest, but she's carrying a tasty prize, so is well worth the trouble. Black Jade is found beside Lazarus in SP and MP games. She doesn't have to be killed to complete the quest, but she's carrying a tasty prize, so is well worth the trouble. Diablo is the name of the game, and the monster that must be defeated to end the game. He's found inside the eastern quarter of level 16, and once he's dead the game ends (which is quite inconvenient if you've left any loot you wanted to bring along, in town. Boss monsters associated with quests that are only found in Hellfire. The Hork Demon has Celia's teddybear if you enable that quest with the command.txt string. If not he's just a regular monster who drops a magical amulet every game. The Defiler is an giant bug who taunts you when you enter the Hive in that horrible squeaking voice. 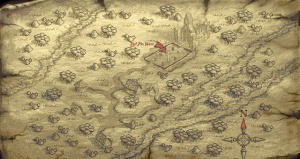 The insect is not valuable for items, but it drops the Cathedral Map, which you must obtain to gain entry to the Crypt. The final boss in Hellfire, Na-Krul is a massive, tentacle-armed demon who is imprisoned within a magical box. He is about as tough as Diablo, but lacks any spells, so can't hurt players from a distance. Opening his box by the lever releases him with much higher stats than if he's released by throwing the three switches in the correct order. This page was last edited on 14 October 2011, at 19:04.